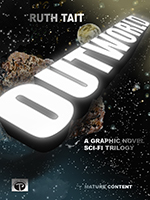 Outworld is a 273-page graphic novel Sci Fi trilogy centering on events around female protagonist, Tihane Delaron. The 3 books represent 3 chapters in the story development of a space sciences engineer. Her task throughout the books is to navigate the complex arena of relationships, both difficult and rewarding and to get her work done, despite its challenges. This book was inspired by the tragic loss to the world of 14 female engineers at École Polytechnique, Montréal on December 6, 1989. In the event that the Kagi link doesn't work and your purchase doesn not result in a download link please contact me directly and I will provide you with a secondary link.